In June, David Driscoll of K&L Wines wrote a series of post called “Drinking to Drink.” While the series touched on a number of things, one of the themes was how whiskey drinkers often correlate price with enjoyment. Driscoll argued that just because one whiskey is $80 doesn't mean that a drinker will enjoy it four times more than a $20 bottle. In that same vein he suggested that there were a number of quality whiskeys that could be had for $20 and enjoyed more regularly without breaking the bank. After reading this series, I was inspired to organize a whiskey tasting of bottles that retailed around $20 or less. I was curious to find out if there was a whiskey that I had overlooked simply because it lived on a lower shelf in the liquor aisle. With some help from another post by Driscoll and my own mental list, I put together a list of six whiskies around $20 for the tasting. I know that Bulleit Bourbon can also be found on sale for under $20 but my friends and I are pretty familiar with it so I decided to leaving it out of the tasting. I also decided to conduct the tasting blind. That there are a number of factors that can sway the perception of how good a beer, wine or spirit is based on external factors like, what shelf it's on in the store, label design, bottle shape and price. 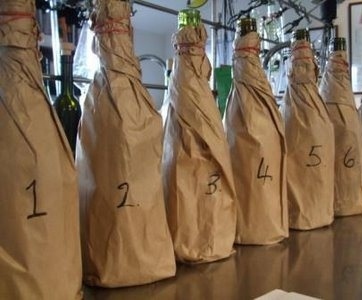 I wanted to get an honest assessment of the contents of the bottles without being swayed by some of those external factors, so I had my wife wrap all the bottles in brown paper bags before the tasting. The night of the tasting a friend of mine hosted the event and provided glasses, snacks and still water. We tasted the spirits in random order in glencairn glasses, neat, at room temperature. We each took notes about what we tasted and gave each spirit a rating. Once everyone had tasted all the whiskeys we revealed each whiskey from lowest to highest score. The undisputed favorite of the evening was Evan Williams Black Label, the least expensive whiskey, which retails at my local Safeway for $9.99. I had tasted Evan Williams only once before a few months prior and I thought it would do well in the tasting but I didn't expect it to come out on top. Next came Buffalo Trace and Old Weller Antique. I wasn't that surprised that these did well for the whole group but personally I was shocked that I had rated Old Weller above Buffalo Trace. This surprised me because I really like rye whiskeys and I have never been a fan of Maker's Mark. I assumed that this meant that I didn't like wheated bourbons and that I preferred bourbons with rye in their mash bill over wheat. But even at 107 proof, I felt like Old Weller was more balanced and had more character compared to the 90 proof Buffalo Trace. Dickel, Beam and Bank Note finished in the lower half. Bank Note is a blended Scotch, and for the price I still think it is pretty good but I suspect that compared to all the bourbons it stood out like a sore thumb, and not it a good way. The results that evening are exactly why I like to do blind tastings. My assumptions about what I do and don't like were challenged and as a result I now have two new favorite whiskeys under $20: Evan Williams, and Old Weller. On May 13th 2013, Bill Haslam, governor of Tennessee (TN) signed House Bill 1084, which created the first state law to define what can be called Tennessee Whiskey. The law defines TN whiskey as: a spirit manufactured in TN; filtered through maple charcoal prior to aging, also know as the Lincoln County Process; made from grain that consists of at least 51% corn; distilled to no more than 160 proof (80% abv); aged in new charred oak barrels; placed in the barrel at no more than 125 proof (62.5% abv); and, bottled at not less than 80 proof (40% abv).